The Valley X-Tec center drive motor with FastPass technology enables high-speed irrigation. It's perfect for chemigation and increasing crop yield. The Valley 8000 series center pivot meets producer demands on all types and sizes of fields. The Valley 7000 series center pivot is an economical choice for growers. The Valley 5000 series center pivot is ideal for production ag fields up to 60 acres. The Valley Precision Corner helps to increase your profitability by putting more of your acres into production. The Valley VFlex Corner economically irrigates more of your land with its completely customizable design. The Valley Bender30 and Valley Bender160 are irrigation system options that maximize irrigation acreage. The Valley DropSpan irrigation option maximizes irrigated area by economically adding additional acres. The Valley Rainger Linear is ideal for large field coverage. The Valley Two Wheel Linear is the ideal solution for smaller fields. The Valley Universal Linear easily switches from linear to pivot mode. Pump Connect from Valley is an easy, affordable way to automate the operation of the pumps that supply center pivots. Variable Frequency Drives from Valley Water Management (VWM) control your pump motor’s speed to deliver only what your operation needs to function at optimal efficiency. The Valley 3000 flowmeter from Valley Water Management (VWM) provides un-obstructive flow and superior resistance to wear. Nelson Irrigation offers a full line of high performance sprinklers, designed for your needs. Senninger provides low pressure - high performance sprinkler solutions for your operation. Komet manufactures innovative center pivot irrigation sprinkler solutions and options to suit your needs. The Valley gearbox is American made, Valley strong. Center drives from Valley are engineered for reliable service. The Valley X-Tec center drive motor with FastPass technology enables high-speed irrigation. It’s perfect for chemigation and increasing crop yield. The Valley Revolution Airless Tire eliminates flat tires in your field. Standard drive unit and irrigation tire options for Valley center pivot and linear irrigation equipment provide you with reliability year after year. Valley offers the 3-Wheel Drive flotation solution to help limit your downtime. The Valley Track Drive flotation solution for the 8000 series center pivot helps keep your center pivot from getting stuck. The Valley Articulating Track Drive flotation solution is perfect for hilly and muddy fields. You won’t need to worry about deep wheel ruts and a sinking, stuck center pivot for long with the Valley Articulating 4-Wheel Drive flotation solution. Valley PolySpan is a polyethylene liner that is installed inside your span pipe, and it protects your pipe against the effects of acidic, alkaline, corrosive, and saline water. Converting oil hydraulics to electric drives is made easy by Valley, The Leader in Precision Irrigation. Converting your drive train with Valley is made easy by The Leader in Precision Irrigation. Improve reliability and extend the life of your center pivot with a new tower control box conversion from Valley. Repiping center pivots and linears may extend the equipment’s lifespan. Replacing or upgrading a center pivot sprinkler package may improve irrigation application uniformity and effectiveness. Cascade-Earth Sciences (CES) specializes in the reuse of wastewater. Apply the know-how of Valley and CES to your farm management. 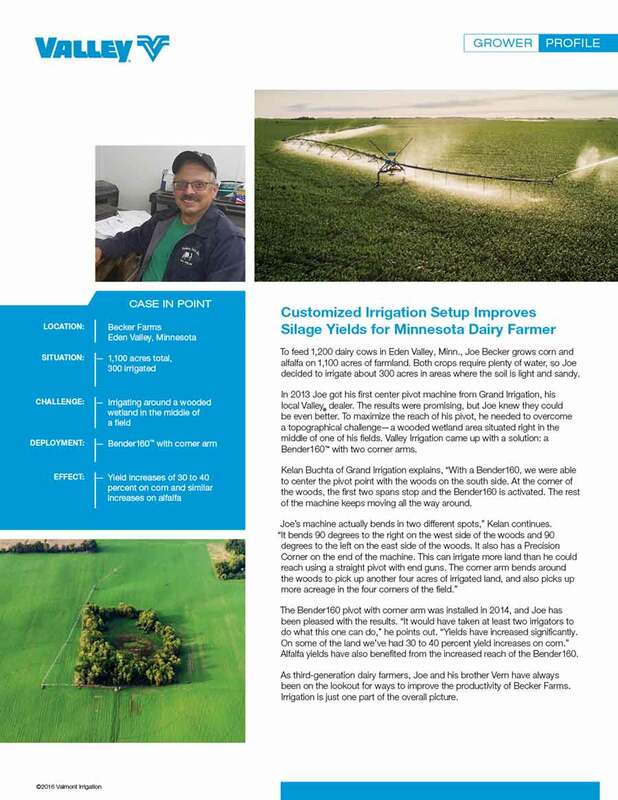 As the worldwide leader in precision irrigation, Valley continues the effort to promote the use of center pivot and linear irrigation for dairy management. Valley center pivot and linear irrigation equipment give producers peace of mind during dry weather and droughts. Valley Irrigation is currently overseeing research on modern, water-saving rice irrigation techniques which leverage center pivots and linears. Valley Irrigation is the worldwide leader in precision irrigation. Valley Irrigation continues the effort to promote irrigation efficiency education through the use of center pivot and linear irrigation in California to produce alfalfa. Center pivots and linears from Valley will help eliminate common problems found when using other methods of irrigation to grow sugarcane, as well as provide you with the best cost value. Have an idea or invention? Let us know! The Most Advanced Data Analytics Technology In The Field. Valley Scheduling helps make informed irrigation decisions using data about soil, crop type, development stage and weather conditions. The Valley ICON10 smart panel for farm irrigation features a 10" touchscreen. It’s similar to using the touchscreen on your tablet, but now it’s on your center pivot. The Valley ICON5 smart panel for farm irrigation features a smaller, 5-inch touchscreen interface with soft keys that mirror the touch control functions. The Valley ICON1 smart panel is a remote access control panel for farm irrigation, and is controlled exclusively through a remote interface. The Valley ICONX smart panel for farm irrigation takes control of existing center pivot panels, no matter the pivot brand, using the panel’s circuits and delivering full ICON touch control. Valley ICON Link is a remote management module designed exclusively for Valley ICON smart panels for farm irrigation. Easily program your linear irrigation functions and improve crop management with the Valley AutoPilot Linear control panel. The ClassicPlus control panel from Valley Irrigation, the leader in precision irrigation, will grow as your needs grow. The Classic control panel from Valley Irrigation, the leader in precision irrigation, is an entry-level panel designed for in-field control. The Valley BaseStation3 is the most state-of-the-art irrigation management solution on the market. BaseStation3 gives you total control of your operation - anywhere, anytime. Remote irrigation technology management solutions from Valley Remote Irrigation Management integrate digital cellular technology to remotely monitor, start and stop a center pivot. Valley Run Time is a mobile app that helps keep track of your irrigation run time. It's simple and – best of all – it's free! Variable Rate Irrigation (VRI) Speed Control from Valley Irrigation, the leader in precision irrigation, offers site-specific irrigation for your operation. Variable Rate Irrigation (VRI) Zone Control for center pivots and linears from Valley Irrigation, the leader in precision irrigation, offers site-specific irrigation for your operation. Variable Rate Irrigation from Valley Irrigation, the leader in precision irrigation, offers site-specific irrigation for your operation. Valley VRI Individual Sprinkler control (VRI-iS) offers you the greatest level of control in center pivot water application, so you know you are using valuable water resources wisely. GPS Ready controls from Valley Irrigation, the leader in precision irrigation, offer GPS Position for your center pivots and linears. GPS Guidance from Valley Irrigation, the leader in precision irrigation, offers precision application with GPS technology for corner and linear irrigation machines. Read about the current special offers, provided by your local Valley dealer. Choosing the right irrigation technology, equipment and practices are key to maximizing your farm’s revenue. Educating yourself and your co-workers can help you and your team make the right decisions. Our top 10 ways to keep your center pivot irrigation equipment in top shape throughout the year. Watch these short quick tip videos to help you set up and troubleshoot basic center pivot and linear irrigation programs and issues. Browse and download our exclusive eBooks on Valley irrigation equipment and technology - perfect for on-the-go reading! Browse and download any of our product brochures and catalogs. Everyone seeks a solution to a problem they experience. Chances are, someone already found a solution to your same issue! Read our case studies to see if any of our growers can help you out. Regardless of the space or purpose of the lighting, we provide standard or custom-made light poles, lamp posts, high-mast light towers and accessories in a range of designs and materials that exceed all governing design codes. A picture says one thousand words. View photography of Valley irrigation equipment and technology to know better our story. Browse and download Valley Owner's Manuals. Read through articles on our blog for current stories, educational material and answers to your irrigation questions. Read the latest edition of Valley PivotPoint Magazine, your one stop for grower stories about how they applied the latest Valley equipment and technology. Subscribe today to be the first to receive each edition by email. Read the latest news from Valley Irrigation, the leader in precision irrigation. We make purchasing your irrigation equipment easy through our authorized finance provider. Diversified Financial Services will make your dream, and your investment, come true, helping you take the final step toward ensuring your farm's future. When your center pivot stops in the heat of a dry summer threatening your crop yield, you can trust that your Valley dealer has the education and technology necessary to resolve the problem quickly and efficiently. Learn how the leader in precision irrigation became the most trusted name in irrigation. Watch and read what growers say about Valley in our testimonials. Valmont and Valley are recognized throughout the world as an industry leader in engineered products and services for infrastructure and water-conserving agricultural irrigation equipment. Valley Irrigation is the worldwide leader in precision irrigation. The Valley brand of center pivot, linear, and corner equipment provides solutions for conserving water and meeting the growing demand for food. A career with Valmont is a career with a future! Valmont is a global manufacturing company with employment opportunities around the world for qualified candidates. Have questions about our products, dealers or company? Answers are always just an email or phone call away. Are you ready to learn more about the Valley ICON family of smart panels? Get in touch with us today. Increase your irrigated acres and profitability with irrigation technology innovations. Tree lines and buildings can get in the way of your irrigation operation, keeping valuable acres out of production. Valley® understands this challenge, and that's why we offer the Bender product line for center pivots. Our Valley Benders can be easily, and inexpensively, added to your existing or new center pivot irrigation systems to put those acres into production, which can increase your yields and profitability. The Valley Bender irrigation technology options can be installed on any span tower, and multiple Benders can be added to the same pivot for maximum benefit. We offer two Bender options to fit your needs: the Bender30™ and the Bender160™. Span diameter options - 6", 6 5/8", 8 5/8", 10"
Span diameter options - 6", 6 5/8"
The Valley Bender is an option added to your center pivot that basically "wraps" it around whatever is in its way: a tree line, a fence, a dairy or other obstruction. Two barriers are installed by your local Valley dealer on either side of the area that you want to irrigate around. When the center pivot reaches the first barrier, the span tower that has the Bender installed, also known as the "bending" tower, keeps irrigating while the rest of the center pivot stops. When the "bending" tower reaches the second barrier, it auto-reverses until it becomes flush with the stopped portion of the center pivot, which will then resume irrigating in normal fashion. Only Valley offers an anchor for its bending drive units because only Valley center pivots have the strength to handle long Bender machines. With this anchor structure, you can use Valley Benders on longer machines, as well as on rough or rolling terrain. Choose which type of content you'd like to read, download and/or watch. Only your local Valley dealer can give you the best advice on which irrigation equipment and options are right for you. Find your dealer today!